Another spectacular event brought to you by Jazzy Group, 《Lee Min-Ho Concert in Malaysia 2013》. 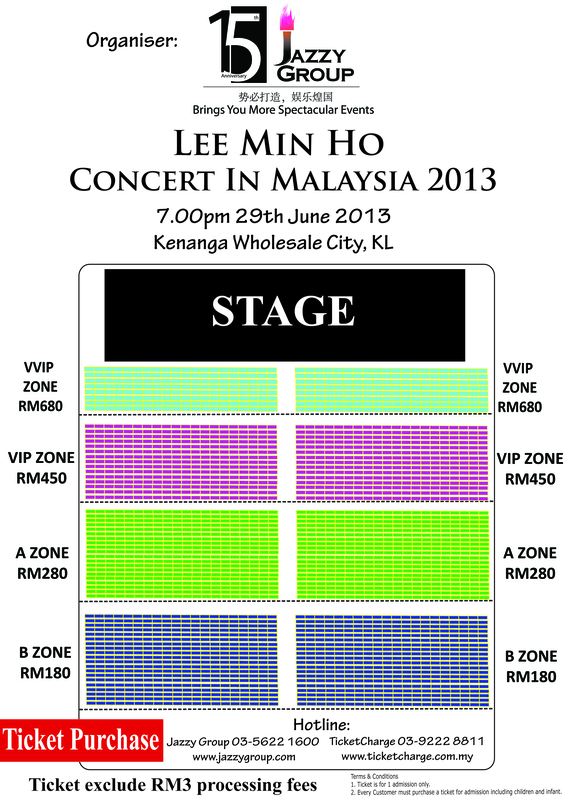 Jazzy Group will be bringing Lee Min-Ho to Malaysia, to hold his world live concert at Kenanga Wholesale City (KWC Level 15) on the 29th June 2013, at 7.00 p.m. Tickets will be available starting 26April 2013 (Friday) at 11a.m. For zone VVIP only can be grab at Jazzy group office. Lee Min-Ho was born in Heukseok-dong, Dongjak-gu, Seoul, South Korea on June 22, 1987.In the 2nd year of his high school career, Lee Min-Ho turned his attention to acting. By the time of Lee Min-Ho’s senior year in high school, he joined Starhaus Entertainment with the help of an acquaintance. After going through training, Min-ho started auditioning for roles and landed smaller roles in several television dramas. His major breakthrough came with Min-ho landing the lead role in the KBS2 drama “Boys Over Flowers” as Ku Jun-pyo. The television series became immensely popular and regularly received ratings of over 30% in South Korea. Lee Min-Ho is currently majoring in Film & Art at Konkuk University. In 2011 Lee Min-Ho starred in popular drama series “City Hunter.” The drama was based off a Japanese manga by Tsukasa Hojo. With the release of Lee Min Ho’s special album, he will go on a live world tour concert series to 10 countries including Korea, Beijing, Taipei, Bangkok, Osaka, Tokyo, Malaysia, Shanghai, Myanmar and Hong Kong. The tour will last until July and each concert will be in the hybrid format of a talk show. However, the purpose of this album is to thank to supportive fans. Lee Min Ho’s domestic and international fans have been asking for this album and Lee Min Ho put two years of time and effort into this album in return. Moreover, a part of the profit made from this album’s sales will be donated to charitable organizations helping people in need. Until now, Lee Min Ho prepared a song for every fan meeting he’s hosted but never released the song officially or performed elsewhere. Come and join us at Kenanga Wholesale City (KWC Level 15 as the venue sponsor) to enjoy his loveable and spectacular performances that will definitely melt your heart. On the other hand, you can do some shopping at KWC too, before the concert starts. Stay tune always with Jazzy Group Facebook, Jazzy Group Twitter, official radio station One FM & Hot FM, and official TV station One HD & 8TV for their latest news update. Hurry, purchase your tickets now via Jazzy Group’s office or the ticketing agent, Ticket Charge.